List of all large Setlist images in GBVDB. Guided By Voices Beat Kitchen - Chicago, IL [Live] 07/28/2017 U.S.A. Setlist Posted By Bobby Bare Jr. Guided By Voices Roxy - West Hollywood, CA [Live] 04/22/2017 U.S.A. Setlist Posted By Bobby Bare Jr. Guided By Voices Nuemos - Seattle, WA [Live] 04/18/2017 U.S.A. Setlist Posted By Bobby Bare Jr. Guided By Voices Bimbo's 365 - San Francisco, CA [Live] 04/15/2017 U.S.A. Setlist Posted By Bobby Bare Jr. Guided By Voices Underground Arts - Philadelphia, PA [Live] 12/30/2016 U.S.A. 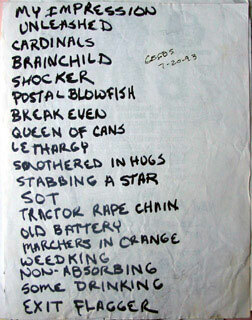 Original Bob Setlist Posted By Bobby Bare Jr. Guided By Voices 1st CBGB's show setlist.